Canyon Shake provides the durability you’d expect from a metal roof and comes with all the ratings and features such as a Class A Fire Rating, 120 MPH wind coverage, lifetime warranty, and goes beyond the Class 4 Hail rating with a 2 1/2″ Hail stone coverage. Natural Wood shake is great; its upkeep and replacement costs aren’t. Canyon Shake offers the same premium looks while eliminating maintenance costs. Speaking of cost, in most areas all Gerard stone-coated metal roofing systems qualify for insurance discounts, because metal does not burn. Canyon Shake has become a preferred alternative in areas prohibiting natural shake roofs. Gerard stone coated steel metal roofing is designed and built to withstand the harshest of elements for a minimum of 50 years, guaranteed! 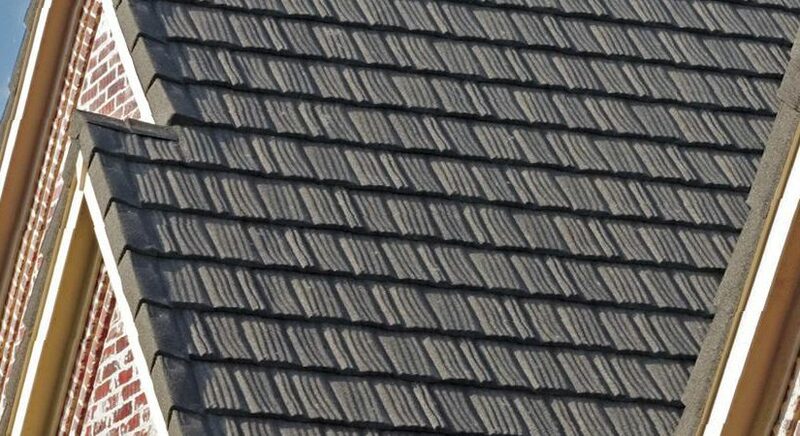 Our high profile patterns, wide color range and proprietary stone chip blending abilities allow us to mimic the profile and appearance of almost any traditional roofing material. Further dimension is created using our proprietary coating technologies to add darker or lighter toned accents on each Canyon Shake metal tile. Not only will your Gerard Canyon Shake roof display more dimension and color than traditional shake, it will continue to look better over time requiring the least amount of maintenance and upkeep. Unlike wood and concrete shake our stamped metal roofing panels do not absorb moisture. Moisture creates mold, mildew and fungus which accelerates the breakdown of traditional shake roofing materials. To further enhance our galvalume steel panels we generously coat our panels under a fountain of high quality acrylic basecoat and poured-on chipped stone for the most durable and attractive roofing finish available. Unlike traditional shake roofing Gerard’s Canyon Shake metal roofing will never crack or break, and you will save a lot of money and time in cleaning and repairs! If you live in a area that is prone to snow and ice, there is no better roof than a Gerard stone coated steel metal roof. Each year, homeowners across America spend millions of dollars repairing damage caused by ‘Ice Damming’. With a Gerard Stone Coated Steel Roof, Ice Damming is virtually eliminated because of the air layer between the metal roof panels and the roof deck. This highly insulating characteristic causes the snow on your roof to melt much faster than on conventional roofs, greatly reducing the possibility of water freezing at the edges of your roof.